Today, as America celebrates its independence from the English, we set forth on a journey across the country of our greatest ally in that fight: France. We started the day off in Dijon and our destination was Bordeaux. We had to leave Dijon early and could not afford the time to buy any mustard, which is kind of a shame. However, I suspect that their mustards are pretty regularly available in the rest of France and the world. The route started out simply enough. 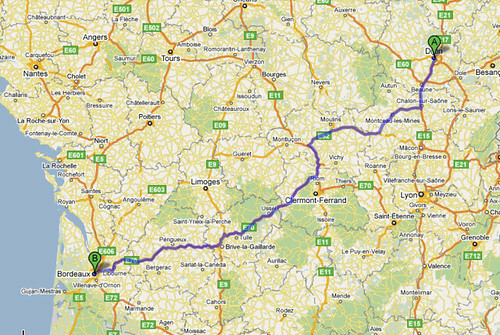 We would follow the route above, observe the French countryside, and stop only for a quick lunch. What could go wrong? We hit a bit of traffic. After standing still for about twenty minutes a gendarme kindly came over and started explaining to cars that the road was closed and we'd have to turn around. That's right. 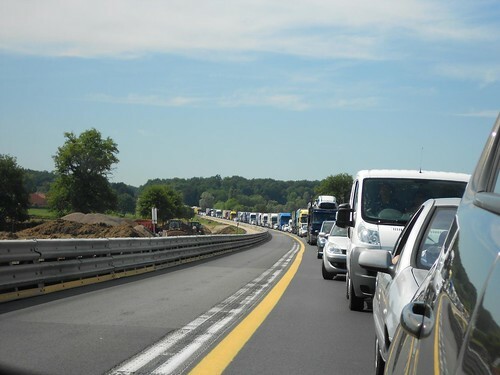 That line of cars you see behind us had to do a three point turn and go the other way, one-by-one. 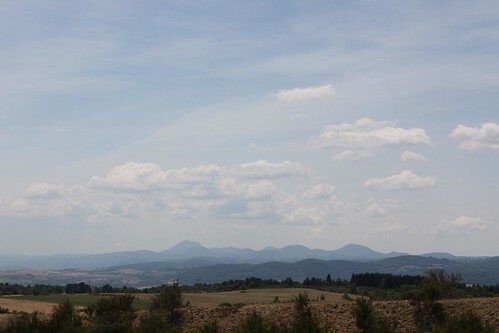 Luckily We were one of the first cars to turn around and I began following a Citroën through Guegnon down to Paray and finally back onto the highway. Eventually we were back on the road, passing the fantastic fields of sunflowers, with the wind in our hair. The wind from our Puegot's air conditioning, that is. 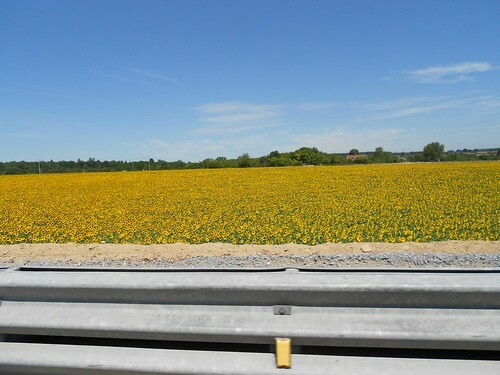 I had wanted to stop by the side of the road and take pictures of the sunflowers but there just really isn't a way to do that on French highways. There are very few shoulders and technically you're supposed to wear this giant reflective vest and hold a flag for safety or else the police will come by and fine you. So, unfortunately, I had to skip my sunflower pictures for today, my second biggest photo regret of the trip so far. 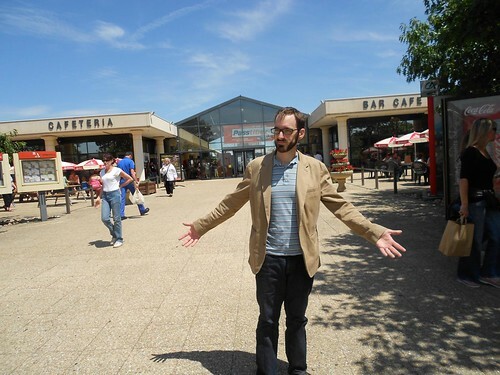 We also stopped by a strange rest stop for lunch where we waited in line for twenty minutes to get some sandwiches. Oh, and one more thing, this rest stop was near a volcano! Okay, not that near a volcano, but near enough that everything at the rest stop was named after the volcano and there was a lookout where you could spy on said volcano. Kathy says: "Rest stops! Rest stops! You're such an American! If rest stops are the highlight of your trip I'm not surprised. Only someone uncultured enough to ask someone to move on a plane would be entertained by such an American thing! I always stay off the highway and count on local guides to show me those things that tourists won't find on their own! After a long day of driving we finally ended up in Bordeax which, by my calculations, may be the worst city I've ever driven in during rush hour. 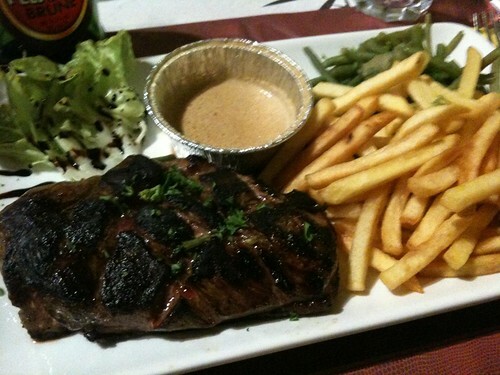 After spending 30 minutes to go in a tiny circle past the hotel to the parking garage, we got settled then picked some friends up from the airport and all had dinner at The Central Pub in Bordeaux. 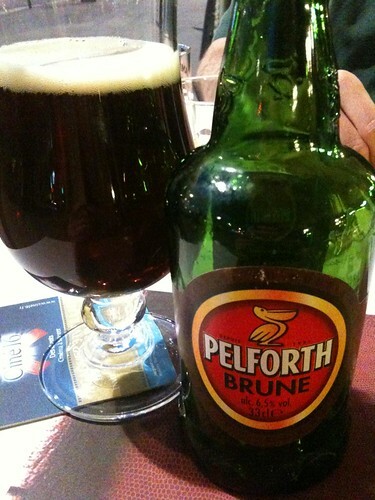 I tried another beer I'd never had before, the Brune by Pelforth, a fantastic way to cap off a full 8-10 hour day of driving. While Jen ordered the flammekueche (which ended up being something completely different than we expected) I ordered the duck breast with pepper sauce, pomme frites, and green beans with shallot. 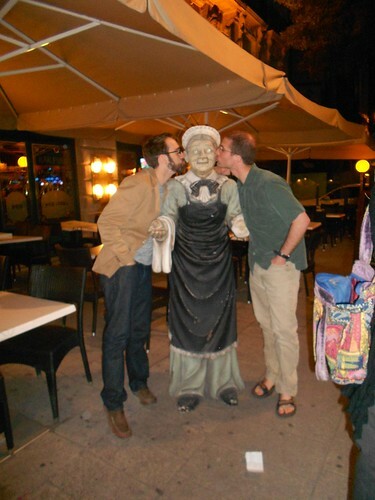 This statue outside the restaurant attracted three separate guys who were bumming cigarettes (and presumably homeless). One of them ended up speaking with the statue for quite some time and I think he even made out with her. Jealous, we decided to court the woman as well. Since we didn't smell like urine I think we may have made the best impression out of her group of suitors.